Luxury on a level only to be found in magical Hawaii. The Paul Mitchell estate is one of the most beautiful villas in all of Hawaii. Offering one of the best ocean views in the world, this tropical oasis is a collection of uniquely crafted bungalows styled by a serene blend of South Pacific and Indonesian grace. 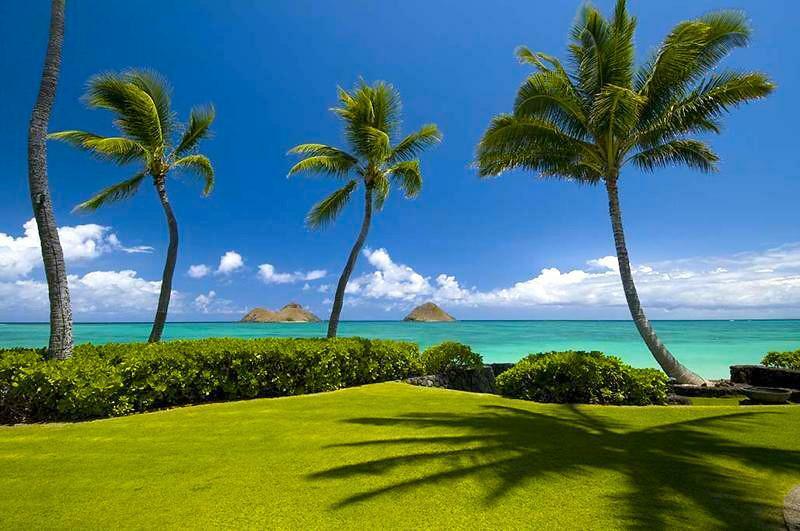 Situated in gorgeous Lanikai, the estate seems to melt into the surrounding native foliage and ocean breezes. Far enough away from it all to find absolute tranquility yet close enough to Honolulu and Waikiki to enjoy a fine meal. The estate combines contemporary amenities with superb traditional island craftsmanship. Seven separate buildings punctuate this tropical paradise. In the main house, the ceiling soars high above the living room, supported by hand-selected ohia trees. The estate includes a two-bedroom guesthouse, a Japanese bathhouse with a furo bath and sauna, an entertainment pavilion, pool cabana with waterfall and secluded hot tub, staff quarters/carriage house, and a garage with wine cellar and storage rooms. $6,250 - $9,375 per night. 30% down to hold a reservation. Balance due 100 days before check-in. $10,000.00 security deposit. $1,500.00 cleaning fee. 4% processing fee. Listed rates do not include tax. Holiday and peak season rates and required length of stay may be different than quoted above. Credit cards, cash, checks and wire transfers accepted. Minimum night stay varies amongst the various rental units. Many rentals have 30-night minimums. Tax number: TA-162-678-7840-01.